Our celebration of the Solemnity of Pentecost and the Birthday of the Church is just the beginning. Please join us as we continue to celebrate Jesus’ gift of the Holy Spirit at Pentecost and joyfully praise and thank Him for the good news of our salvation. Please come and experience the love and joy. For more information, call Tony or Sue Conrad at 814-941-3832. Building up the body of our Lord and Savior, Jesus Christ, to evangelize the Diocese of Altoona-Johnstown is our purpose. We long to share the good news of his love with a hurting world. A powerful part of our approach is joy-filled music. Our annual one-day Life in the Spirit Seminar draws over 300 participant from all over the Diocese of Altoona-Johnstown, as well as other dioceses. Its goal is a deepening of our relationship with Jesus through Baptism in the Holy Spirit and a fresh outpouring of all the evangelistic charisma, or gifts of the Holy Spirit. Once a month we celebrate a special Festival of Praise with praise and worship music, teaching by a priest, and Eucharistic Adoration, followed by a prayer ministry or fellowship and refreshments. Our annual Vigil of Pentecost Festival of Praise serves as a joyous reunion for those who have participated in the Life in the Spirit Seminar. “St. Joan of Arc Charismatic Prayer Group” meets the last Sunday of the month in St. Joan of Arc’s Church on Rt. 53 in Frugality, PA with Chris Sanker leading the music ministry. “Good News Catholic Charismatic Prayer Group” meets Tuesday evenings from 7 to 9 p.m. in the John Paul II Building, Room #1, at St. Benedict’s Church, 2310 Bedford St., Johnstown, PA 15904, with Fr. Bob Hilz, TOR. All are welcome to join in thanking God for his many blessings. If you have any question, please contact Joe or Connie at 814-266-7109. 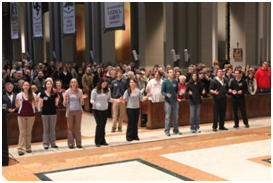 “Sharers of the Word,” a student-led Catholic charismatic prayer group, comes together every Thursday (except the third Thursday) of the month from 8 to 9 p.m. in the Immaculate Conception Chapel on the campus of St. Francis University in Loretto, PA. All are welcome to praise the Lord in song and through the gifts of the Holy Spirit. The group also hosts a “Night of Worship” on the third Friday of the month from 8 to 9 p.m. in the chapel.